Tulsi Mala, or Tulsi Rosary, is made using the Basil Plant. Tulsi is a sacred plant associated with Lord Vishnu, Sri Krishna and Goddess Lakshmi. Mala made from Tulsi plant is said to have medicinal values. It is also believed that the place where Tulsi mala is kept remains pure. 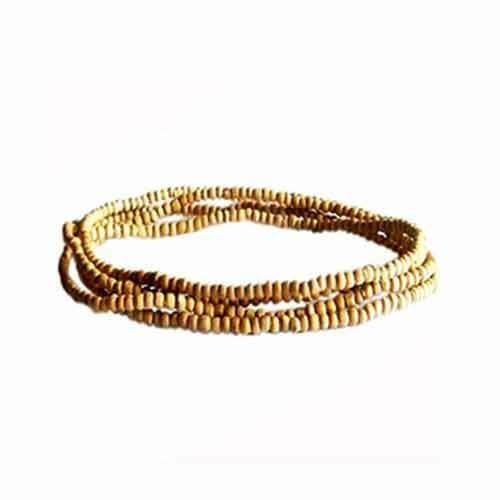 Tulsi Mala is worn by Ayyappa devotees when they are undertaking the Vratam to visit Sabarimala Ayyappa Temple in Kerala and have darshan of Lord Ayyappa. The Ayyappa mala is worn during the entire period of vratam and is only removed after returning home back from Sabarimala. Wearing of Tulsi Mala is believed to help in curing diseases like fever etc. It is also said that a devotee who wears Tulsi mala develops mental peace and strong devotion. Small balls are made using Tulsi plant and this is used to make the Tulsi mala and rosaries which devotees wear. Some people also offer Tulsi mala to Lord Krishna. Tulsi Mala is also made using leaves and stems and this is usually offered to Lord Vishnu or Lord Krishna. Chanting mantras of Vishnu, Krishna, Lakshmi and other avatars of Lord Vishnu using Tulsi mala is highly benefitial.